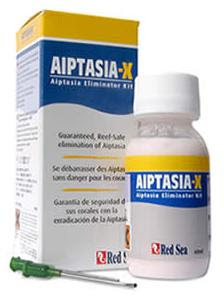 There is a buzz in the reef aquarium community surrounding the release of Red Sea’s new pest anemone treatment, Aiptasia-X. I’ve read the forums. I’ve spoken with fellow reefers. It isn’t skepticism. We’ve simply tried other aiptasia treatments and, well… you know how it is: you treat your tank and just when things start looking better, all of a sudden, a new colony appears even larger than the last. It’s not that we don’t believe this new treatment will be different. It’s just that we’re afraid of getting our hopes up. That is why I am pleased—even excited—to report that Aiptasia-X works. Remarkably well, in fact. So well that I have no reservations stating here, in writing, that Aiptasia-X is the most effective aiptasia treatment I have ever used. What’s so different about Aiptasia-X? Superficially speaking, not much. Pop open the box and you’ve got your standard issue aiptasia treatment: a bottle of goo and a syringe. Look closer and you’ll see the applicators have metal tips. Seemingly inconsequential, however, if you’ve used other aiptasia treatments, you know that plastic-tipped applicators inevitably get clogged with dried gunk. Then you get to play the “stick the paper clip in the tip” game, which, although vexing, is better than the alternative “push the plunger as hard as you can until it squirts all over your tank” game. The second thing I noticed upon closer inspection was that the size of the bottle is 3 times larger than the stuff I usually buy to treat aiptasias. Scoring 3x the treatment plus two—one curved, one straight—metal-tipped applicators for only a couple of dollars more than I normally fork over is a heckuva deal. But let’s cut to the chase. How effective is Aiptasia-X at exterminating glass anemones? In a word: X-tremely. Since Aiptasia-X is sensed as food, injecting it near the oral disk of an anemone will stimulate it to expand and ingest the treatment. Another difference between Aiptasia-X and other like-minded products on the market is Aiptasia-X globulates as it enters the water, forming a thick adhesive that seals the anemone’s oral disk and mouth, thus preventing the release of planulas (larvae). Within 60 seconds, the aiptasia implodes, just like Red Sea demonstrates in their video, eradicating both the anemone and planula. As you might imagine, this can be very entertaining if you’ve treated an entire colony of aiptasias. My marketing cohort and I imagined the aiptasias imploding to the volley of cannon fire in Tchaikovsky’s famous 1812 Overture. I’ve used Aiptasia-X three times and made two noteworthy observations regarding its interaction with the corals in our tank. First, I believe Red Sea’s claim that Aiptasia-X is sensed as food because each time I used it, our Trumpet Coral protracted its feeder tentacles (not to mention the anemones reaction, which was to expand rather than retract into a hole). Second, I accidently squirted a decent-sized globule on our Orange Montipora and it left a white blemish about ½” long and ¼” across, even after I blew off most of it with our squirt tube. Since this only happened yesterday, I’m not sure if individual polyps were killed but either way I’m confident Monty’ll make a comeback. A similar stain appeared after our frogspawn latched on to Monty but the spot eventually returned to its striking orange in no time. And that’s pretty much the gist of it. I’ll keep an eye on Monty and let you know if the white spot doesn’t clear up, but otherwise, I’m giving Aiptasia-X a “killer” rating.